The story of Cinderella hits close to home in this romantic novel by Allison Lane. Our “Cinderella” is Catherine and is very much like her. She works for her family, horrible cousins and aunt and uncle, but she doesn’t have any helpful mice around. Catherine does have some friends to help her out but her Prince Charming is anything but. Catherine Braxton had adored Damon ever since she was a little girl, and Damon was her older brother’s best friend. But that was long ago. Her brother was gone now, slain in war. Catherine herself was an orphan in a household of rapacious relations who had reduced her to shocking servitude. And Damon had become the Earl of Devlin, engaged to the most beautiful belle of the ton. Well as I was reading this the thought came to me that this is the tale after Cinderella gets her man and finds out that he is not as charming as he appears. That there is not a happy ever after. Of course in the romance world that usually is not existent. Romance and happy ending usually go side by side with the ups and downs the characters must endure. I have to say I really like the characters. Damon pissed me off throughout most of the book because he was so blind. Why couldn’t he really see what was happening? And why couldn’t he be nicer to Catherine? But then love is blind. Catherine was a great character as well because of all that she had to endure from her family, husband and all of society. I wasn’t expecting to like this story as much as I did so it was a nice surprise. Allison Lane created a hit with The Unscrupulous Uncle. Just when you think those regency books are slightly getting boring there is a book that pulls you out of that stage. Lady Jane’s Nemesis does that for me. Since her birth, Lady Jane Sinclair has been unofficially betrothed to Roger Hastings, heir to Trenton Abby. But at twenty-five, Jane remains unmarried-and the rumors of Roger’s liaison with the immodest Lady Horton have spread like wildfire. While out riding, she discovers her betrothed in a tryst among the flowers-and need not see the face of his lover to recognize the unlaced corset of Lady Horton. Jane is cut by his scandalous behavior, but Roger’s rougish figure nonetheless torments her in her most private moments. But suddenly, Roger proposes-and though Jane is now assured of the husband she desires, Lady Horton’s challenge threatens to destroy her fragile future with Roger before it begins. And even if she has never know the fiery passions of desire fulfilled, she knows she must lure Roger away from his wanton woman-if her tender love is to bloom. Patricia Oliver transformed this lighthearted regency novel into something that was interesting, frustrating, filled with betrayal and hidden love. I love the character of Jane. She is strong and determined but I wish she did more. I guess being of the modern woman I would have yelled more or not have forgiven all of the husband. It kinda pissed me off he couldn’t be man enough to actually admit what he had done. And the character of Lady Horton well Patricia Oliver did a good job on making the woman villainous. Very frustrating character. But Roger was not all so bad. He found himself in love with her and wanted to do right by Jane but he kept putting off telling her. I thought the novel had a lot of appeal through the betrayal and the fight of trust which Jane had to go through. She fought for her love to be crushed time and time again but in the end there was peace. That is the kind of ending that was needed for the book. And as all regency books go love does find a way. “At First she could not believe it. She was no longer Kathryn Vansomeren, a twentieth-century career woman trapped in a trouble marriage. Instead she was Rosalind, a Regency beauty torn between her husband, the cold but compellingly commanding Sir Dane Marchwood, and handsome, adoring Thomas Denham, who begged her to break her marriage vows. Truly when I first read the back I wasn’t sure that Sandra Heath would be able to deliver this strong story but she was. I have read other novels where characters switched places for a time and some stayed and some didn’t. The switch for these two women were perfectly made and needed to be done, even though Kathryn was hesitant. I really liked the plot and characters they were fascinating and the sensuality of the characters was interwoven perfectly. Although at times during the book I wasn’t really liking the characters of Kathryn and Rosalind but in the end I found myself cheering them on, well really more Kathryn. And I was estactic to read that Heath put the ending so you know everything was truly perfect for both of the women in their new lives. 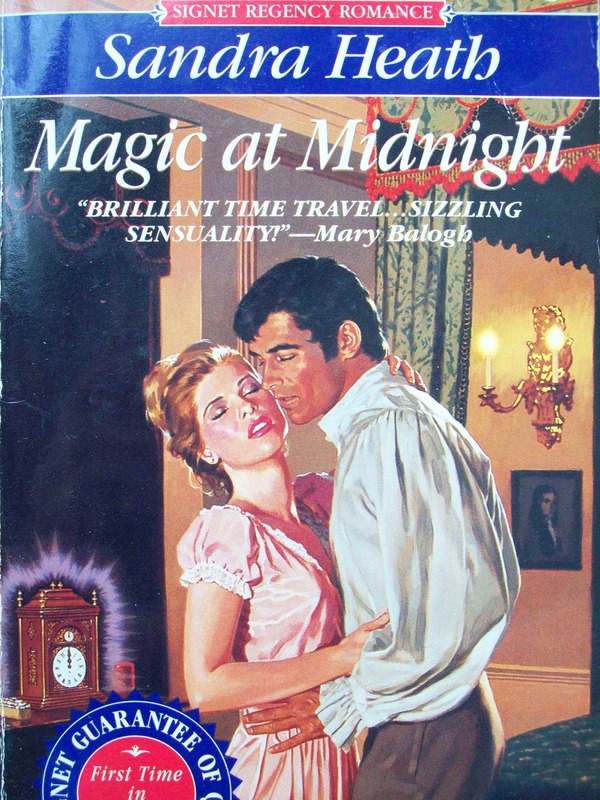 Magic at Midnight was a delight to read and Sandra Heath delivers a truly intricate, suspensful, charming plot through this book. Upholding a household, refusing a proposal, dressing like a man and adventuring out to the bayou country to find her father were just a few things Emilie Gallant had to endure. As a romance novel I was immediately drawn to Emilie and Lorenz who were fighting love well only one, Emilie. Emilie fought tooth and nail to not accept Lorenz’s proposal of marriage. They have been friends since childhood and Emilie has been in love with him but would that be enough. Emilie has been the head of her household as they were separated from their father. She has been in charge of her family and has seen the hardship her mother had to endure without her husband at her side, she didn’t want to loose her own husband in Lorenz. Though Emilie is attracted to Lorenz she can’t admit to it, she is afraid of being like her mother. If something happened to him she would be alone and lose half of her soul. And since Lorenz is impetuous, Emilie is afraid that he will be taken away like her father. Lorenz finally understands Emilie behavior but he still must have her admit her love. Through their struggle of coming together as a couple Emilie and Lorenz fought their way to Louisiana in hopes to find Emilie long lost father. Befriending new friends they were able to get to thier destination only to be surprised by their own family had also journeyed the way with the help of their own suitors but disappointed as news of her father got back to them. Supposedly he was finding his way back to their home town. This was a disappointment for all of them since they have left there. But they knew he would find them when he knew where they went. I loved the book, the trials Emilie put herself through, the sisters relationships they built but I wished I knew for certain that the father did find his way home. But in the romance way there is always a happy ending.